UNITED NATIONS — The UN Security Council was expected to vote, probably on Friday, on a 30-day extension of a UN-led investigation of chemical weapons attacks in Syria to allow for negotiations after Russia vetoed a renewal of the probe. Japan on Thursday presented a draft resolution that would give the Joint Investigative Mechanism (JIM) another 30 days as the United States and Russia work to reach a compromise on the future of the panel. Russia earlier cast its 10th veto on Syria at the council, blocking the one-year extension of the JIM as proposed in a US-drafted resolution that won 11 votes. A Russian-drafted resolution fell short of the nine votes required for adoption, garnering just four votes in favour. The expert team is tasked with determining who is responsible for the use of chemical weapons in Syria. Russia has sharply criticized the JIM after its latest report blamed the Syrian air force for a sarin gas attack on the opposition-held village of Khan Sheikhun that left scores dead. The attack on April 4 triggered global outrage as images of dying children were shown worldwide, prompting the United States to launch missile strikes on a Syrian air base a few days later. 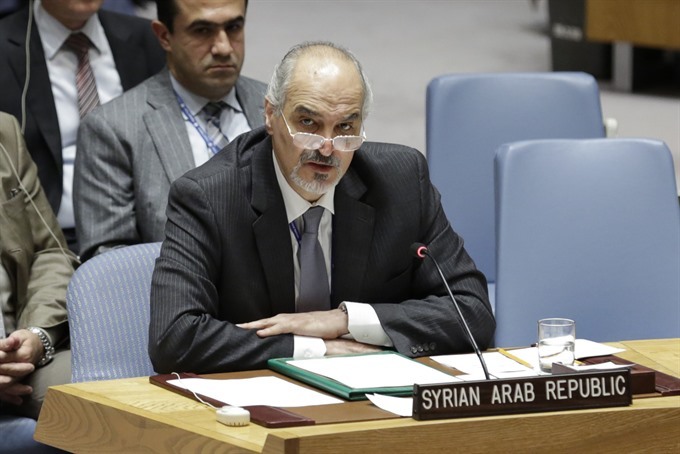 Syria has denied using chemical weapons, with strong backing from its main ally Russia. The Japanese move however revived hope that the JIM could be salvaged. The draft text obtained by AFP would renew the JIM mandate for 30 days and task UN Secretary-General Antonio Guterres with submitting to the council in 20 days "proposals for the structure and methodology" of the panel. Japan requested a vote for Thursday, but diplomats said it was more likely that the council would consider the measure on Friday. Russian Ambassador Vassily Nebenzia said the investigation of the Khan Sheikhun attack suffered from "fundamental flaws" and that the US-drafted resolution was "geared toward entrenching the inherent flaws of the JIM." In its draft, Russia had insisted the panel’s findings on Khan Sheikhun be put aside to allow for another "full-scale and high-quality investigation" by the JIM. The Russian veto came as the United Nations was preparing to convene in Geneva on November 28 a new round of talks to end the six-year war and underscored deep divisions over Syria. Eleven of the council’s 15 members voted in favor of the US-drafted resolution, while Egypt and China abstained. Bolivia joined Russia in voting against the measure. Russia, China, Bolivia and Kazakhstan voted in favour of the Russian draft, while seven countries opposed it. Four countries abstained: Ethiopia, Senegal, Egypt and Japan.